Very early on in my ministry, I had the opportunity to attend a class on homiletics and preaching taught at Asbury Seminary in Kentucky. In that class, the professor, a well-worn and long since retired pastor, was asked how do you figure out each week what to preach on…How can you insure that you are relevant week in and week out. His answer was straight forward. Be authentic, and you will be relevant. Talk about your own struggles. Talk about your own fears. Talk about your own life; with all its associated ugliness, bumps and bruises….and it will be enough. He said you might never become the best preacher in the world… but people will recognize you as a great preacher, and that will be enough. So with these paraphrased words running through my head… I begin this posting. Looking at the last update, I cannot believe It has been almost a full year since I last posted a sermon, a prayer, or anything on the site. It never seemed that long. It didn’t seem long, but the absence was deliberate and intentional. Over the last 18 months my family and I travelled some pretty rocky roads. During it I kept writing, but what came out of me, was solely for me. Journaling has always been an activity of devotion for me. Over the years writing has helped me put my thoughts, my fears, my worries, and my wants all in their right place. When I write I struggle through my faith, work through my doubt, and in the end, have a conversation with God. Over the last twelve months, those conversations have remained between God and me. Slowly over the last few weeks, I started to get the ache again. I wanted to return to this site. It just seemed like the right time. I became convinced of that last week as I found myself typing through a storm. As many of you likely know, a week ago Wednesday, my mother in law passed. Although the phrase mother in law is often used as a punch line to a joke, our family was blessed to have mine living with us for the past 17 years. She was a constant part of our day, and an integral piece of our family. Our heart broke when she unexpectedly left us last week. At the same time, this moment was not entirely unexpected. We expected this reality to be on our horizon in a year or year and half. On the night prior to her passing my wife and I had a discussion about what we were going to do as we moved into this next chapter of life. We were not unaware. We had reached the point where my mother in laws health was failing quicker and quicker. It was clear that we were fast approaching a point we couldn’t do it alone. Someone needed to be in the house virtually around the clock. We were going to be alright with the girls’ home through the summer, but once school opened, we would need to talk about a new way of caring for her. My mother in law had certainly spent many years struggling with her health. Over the last few years, she fought a slew of medical challenges that made day to day hard. We knew the time was fast approaching, but truly never expected it to be so soon. She passed on – to a renewed and refreshed body – a week ago Wednesday. Today we mourn and we celebrate. This is certainly the normal order of life; this is how things happen. We all will grow old, and people will leave us. Both my wife and I are blessed that we have had our parents for so long…and even though all indicators have my Dad and Mom living another 50 years… I know… we know… that this is not how life works. I get this, and I preach and celebrate this; fully, convinced, and unashamed. Yet, with her passing it was yet another moment, when we felt like we were getting our feet under us, the world was finally not shaking as madly, and in an instant the rug was yanked. Our family has had a very shaky 18 months. We began last year with chemotherapy and struggling through my wife’s breast cancer diagnosis. It was a period of seven or eight months that had us exchanging the nice, neat controlled order of our existence with hospital stays, doctor visits, and unordered chaos. When we received the word that the cancer was gone and she we clean, we took a giant deep breath. As we exhaled, we learned that Stacey’s best friend and big brother, both father figure to Stacey and patriarch for our entire family, had been diagnosed with pancreatic cancer. Three months ago, we said goodbye to Sal. His passing has left a huge hole in our family’s life, and we are still trying to wrap our arms around it today. Every day I find a new thing that I need to ask Sal about, and I miss him incredibly. Although saying goodbye was incredibly hard, we were just finding ourselves back to a non-shaky world. We took a deep breath. It seems that just as we were exhaling, we find ourselves having to say goodbye again. The third punch to the gut landed with cruel efficiency. See, I have come to believe – that although we cannot control everything no matter how hard I would like – that life is exponentially easier when ordered. Our family runs smoother, our family is happier, our choices are smarter when they are guided by order and structure rather than chaos. I would imagine that none of you would disagree. At the same time, we all know that life is often more chaotic than controlled for all of us. Acknowledging that reality, I am also very comfortable in saying that I am tired of the chaos. I am tired of forgetting to breathe. I am tired of the floor shaking beneath us. I know that many of you, are probably saying the same thing. One of the coping mechanisms we have in my family is to clean. When we find ourselves closing one chapter of life – whatever that chapter may be – we clean. We don’t just clean; we complete renovate, we purge, and we trash. Maybe it is our way of arresting control back from the chaos. During one such purge – deep in the abyss that we call our basement – I recently found a worn, tattered copy of the book Alice in Wonderland by Lewis Carroll. The pages were warped with moisture and the spine was virtually nonexistent. I held it for a moment before recognizing that the condition was too poor to keep. I realized in that moment that I wanted to read it again. The book is psychedelic, and imaginative and worth a fresh read as an adult. Today, I stand here considering how that story starts. Alice in the controlled and ordered existence which is her life, catches a peculiar man-like rabbit race by her. The rabbit is muttering that he is late for some special or important date. Alice pursues the rabbit and before she knows it she is falling down a never ending rabbit hole. The book details her story in Wonderland. The story created incredible characters imprinted into our culture. The Mad Hatter… Flamingo croquet… The Cheshire cat… For me, I keep finding myself in the Rabbit hole. 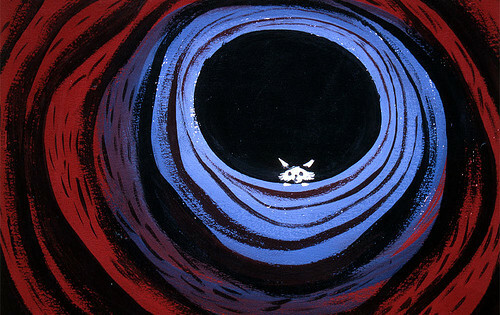 The rabbit hole has become a metaphor of an entry into the unknown, the uncertain, and the chaotic. It is a disorienting trip. It doesn’t make sense. It is full of anxiety, and uncertainty. To be honest, there have been times over the last 18 months when I can’t help but believe we are living in the rabbit hole. Having temporarily claimed this place as home… I also find myself asking some serious questions. I am asking them about myself and about God. How do you find steady ground in moments that hurt? How do you trust God when trusting is hard? How do you trust God, when you find yourself screaming up to heaven that enough is enough? What can I say – knowing that faith is strong in my life and self-imposed or not, that my life as a pastor is somehow supposed to model one way to take this crazy journey – What can I say to those of you who find yourself falling down that hole too? What do I say to you when your life becomes shaky? If I spend my own fair share of time yelling at God and demanding better answers, is there anything to say? I know and I trust that the answer to the Rabbit hole will always faith. I am thankful for the reminder. I am reminded that in the teachings of our faith, I will find the answer. I will learn what it means to take a real rest. I will discover and embrace – through his teaching – the real rhythms of grace. The Gospel message has always been about finding the real rhythms of Grace. Overtime, I have learned to believe that this place of Grace is found in a very simple but powerful formula; show up, be present, open your heart (even if it breaks), and simply and completely trust God. Throughout my life, and especially in moments of chaos, I am working on remembering to listen for and to embrace the signs that remind me that God is present, and the divine will break though. I am working on becoming more deliberate in finding those points of renewal. Some of those aforementioned signs of the divine breaking through are intensely personal, and some of them are visible for the whole world to see. I think of the cardinal that takes up roost with me again and again for just a moment continually throughout my life when I need it the most. I am thankful for those personal reminders. I also think of those things that are clear enough for the whole world to see. I think of the sun returning after a storm, the calming of the sea, or the mist of the morning. These are all reminders that the storm, or the darkness never has the last word. They are reminders that the walls between us and the divine are thin. Maybe this time as my family inhales for a fourth time, we will have the opportunity to exhale. I do hope so. At the same time, I know it will just be for a moment. Nonetheless, I pray for the deep breaths to come. As I close this message, I would like to share a story. It was one of those random messages that came some time ago just when I needed to hear it. NPR – through a TEDx Radio hour – recently told the story of a woman who attempted to swim from Cuba to Florida unassisted. NPR detailed how it is hard to find a harsher piece of ocean than what was found between Havana and Key West. The water is filled with aggressive sharks, jellyfish with the world most deadly venom, and all types of meat eating fish. She was attempting to cross it without the assistance of a cage. She was heading straight into the nightmare. She would swim nonstop for close to 55 hours. She would have to figure out how to eat while swimming, how to avoid the predators, and how to ease the anxiety. If she touched the boat she would forfeit the attempt. It was not too far from her 30th birthday when she first stepped into the water. Along the way she thought about giving up. Her body agonized. She was stung repeatedly by those jelly fishes and harassed by sharks that kept coming closer. She even hallucinated. At one point she thought she saw the yellow brick road below her in the water. To her left were Dorothy, the Scarecrow, Tin man, and Coward lion. To her right was Toto. Through it all she kept swimming forward. Finally after what seemed like an eternity,…she had had enough. Her body and her mind gave up. She stopped with her strokes. Eventually after a few seconds she swam over and in the darkness and fog of the night, touched the side of the boat; marking the end of her journey. Quickly she was out of the water, and huddled in a blanket on the bow of the boat. Within five minutes of her sitting on the bow…the haze cleared. It was then she saw the lights on the shore. They were the lights of Key West. When she had given up, she was less than an hour’s swim shore and completing her gargantuan task. Her defeat and her heartbreak nearly crushed her. She was so close, but couldn’t see it. She didn’t know it. She couldn’t see through the darkness and the mist to recognize that the coast was right there; that relaxation, peace and rest, were just a short swim away. We can too easily be just like her. We can lose the fight against the temptation in believing that no rest is in sight. We can forget the pure truth of our faith, and the truth of the cross that matters most; that deep in the muck, mud, blood, and nastiness of Calvary, God breaks through. It is in precisely when we find ourselves in those moments, moments of hurt, doubt, pain, breathlessness, doubt, question, and struggle, we need to remember that God will break through. I am trying too. ‘Trying to’ is just another name for our faith journey. Learning to remember. It is my prayer that you too can hold on to the promise as you learn to Trust God. Oh and by the way…. She tried 4 more times failing to cross the ocean each time. She eventually gave up. Thirty years later, at 64 and after her mother died, she decided to try one last time. This time when her body was raging, and her mind was convincing her to give up. She kept swimming and eventually she made it. She kept going by reminding herself that the darkness would break. The mist would roll out. She kept going by reminding herself that the light will be there. To that, I say thanks be to good Amen. Thank you, Scott! Our family has gone through some similar times: mother-in-law living with us for 30+ years dying, son dying at age 42 + 2 days, wife with cancer, botched operation, recovery from that, etc. Your analogy of Alice down the Rabbit Hole is certainly a good example and just like you, it was our faith in the Word and the Love of Christ that has gotten us through, AND is still getting us through! Thank you for your post! You have been missed!